Includes Two Years of Free Online Access to sortable ranking tables on the Grey House Online Platform, plus a link to this content can be added to your Salem Press landing page. This comprehensive volume offers a snapshot profile of every public school district in the United States serving 1,500 or more students and provides pertinent evaluative and demographic statistics necessary to evaluate educational programs nationwide. This edition includes profiles on 5,749 school districts in the United States, representing 90% of all public school students in the country. 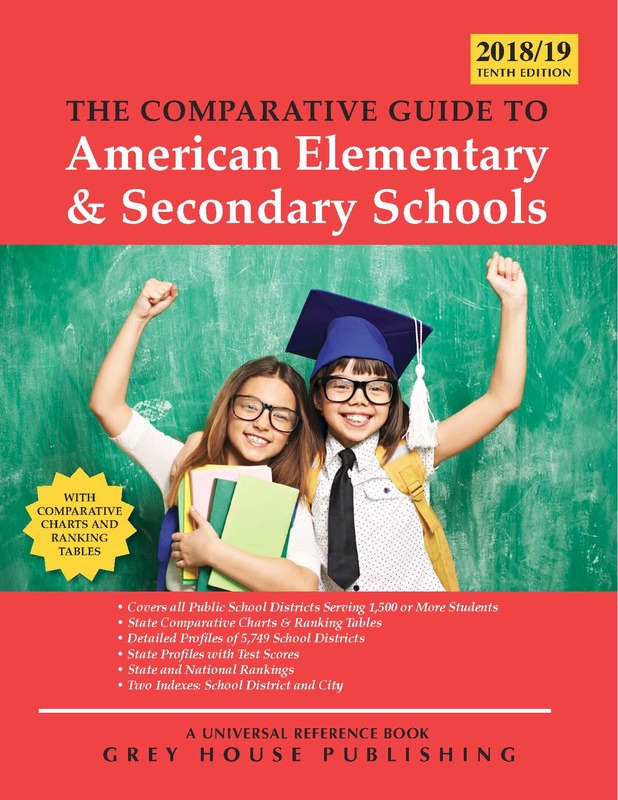 This 2018-19 edition of The Comparative Guide to American Elementary & Secondary Schools is a comprehensive compilation of district details, test scores, and ranking data. It’s conveniently arranged by State chapters, followed by National chapters, a Glossary, and ends with two indexes. These single-page state summaries cover all public schools in the state, regardless of number of students. They detail how the state is educationally, from number of schools, students, and student/teacher ratios, to SAT/ACT test scores, and (NEW) adjusted cohort graduation rates. Includes statewide test scores from the National Assessment of Educational Progress- 4th and 8th grade reading, math, and science scores, broken down by gender, race, and ethnicity. This section is arranged alphabetically by county, then by name of school district. It includes districts with 1,500 or more students. Each district profile includes basic information, including name, address, phone, and web site, and offers data on nine categories: Grade Span; District Type; Number and Type of Schools; Number of Teachers; Number of Librarians/Media Specialists; Number of Guidance Counselors; Enrollment; and Finances. This segment ranks 22 pieces of data. All data points are ranked by school district. This national summary covers all public schools in the nation, regardless of number of students. It details how the country is faring educationally, from number of schools, students, and student/teacher ratios, to SAT/ACT test scores, and (NEW) status dropout rates. Includes nationwide test scores from the National Assessment of Educational Progress—4th and 8th grade reading, math, and science scores, all broken down by gender, race, and ethnicity. This segment allows you to easily compare, district by district, each piece of criteria found in the School District Rankings segment. All data points for the top and bottom 120 schools are ranked. The Glossary covers 77 terms that define need-to-know educational terms, from Alternative Education School to Vocational Education School. Users will find these definitions valuable as they maneuver through the detailed information in The Comparative Guide to American Elementary & Secondary Schools. School District Index: an alphabetical listing of all school districts in this edition, including the city they are located in, and the page number of their detailed profile. City Index: An alphabetical listing of all cities represented in this Guide and the page number of its school district profile(s). The Comparative Guide to American Elementary & Secondary Schools is the ideal source to help parents make relocation decisions and teachers to find desirable school districts. The combination of usability, currency of data, breadth of scope, narratives, detailed information, and multiple access points make this guide invaluable. This edition is a must-have resource in any reference collection. Includes Two Years of FREE ONLINE ACCESS to sortable ranking tables on the Grey House Platform, plus a link to this content can be added to your Salem Press landing page. From zero in 1991 to 3,800 eighteen years later, charter schools (public schools under contract) today educate well over a million students. 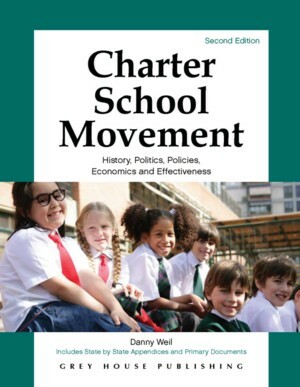 This updated, second edition examines the unusual experiment that is charter education and the controversies that surround public choice and charter schools as a means of educational reform. A reference work that presents a chronology focusing on special education, its development, and the important issues that both positively and negatively affect the field. 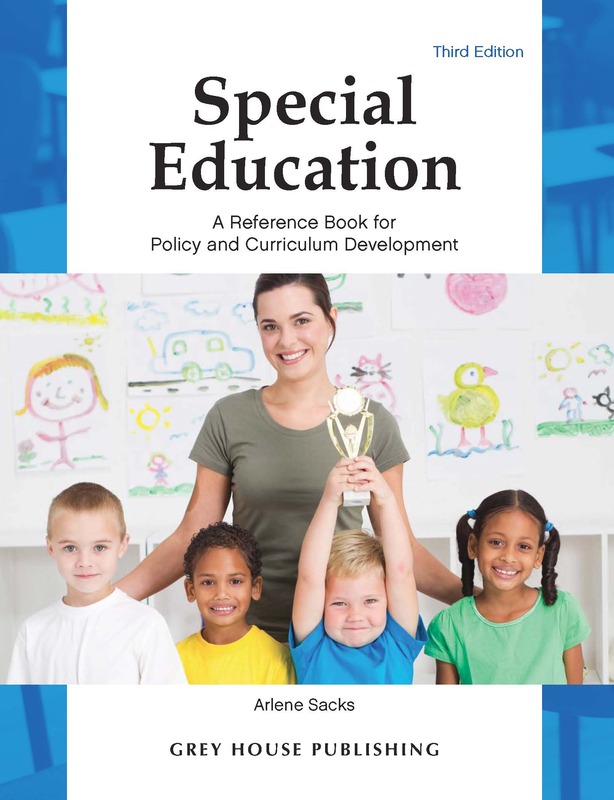 Updated through current events, this second edition provides an excellent introduction to special education in all of its practical aspects—how it developed, its curriculum, assessment issues, the law, and advocacy. 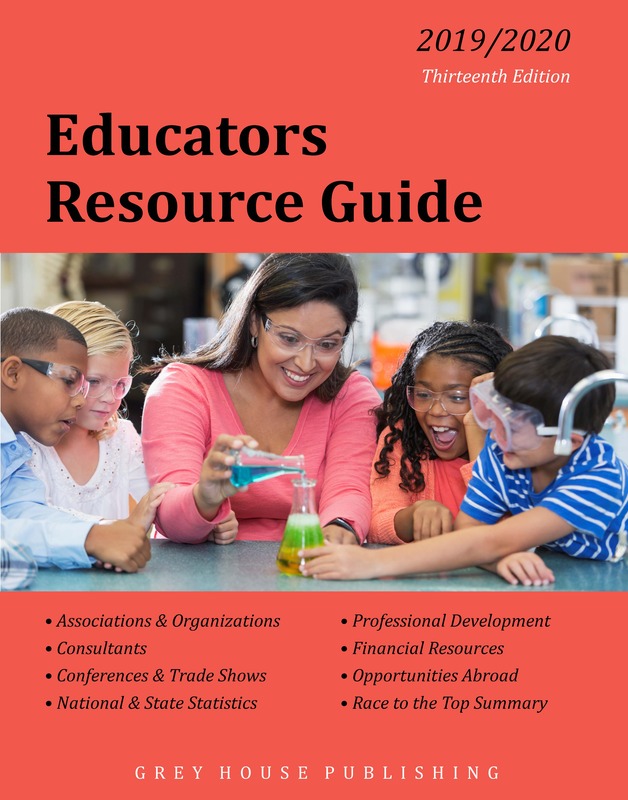 Educators Resource Guide is designed to provide educators, administrators, and other education professionals with immediate access to a unique combination of educational resources, along with important educational statistics and rankings.